Used Vcarve Pro to take my sisters tree photo and transfer it to a piece of oak 12"x10". I'm generally not fond of this kind of jobs (personal taste, no offense intended to photo carving addicts!) but I really like this one. Excellent work for a first try. Thanks! I appreciate that LittleGreyMan! Great job on that one. Especially seeing as that is your first one. Your sisters tree is really cool looking also. Thanks for sharing. That came out very, very nicely! For VCarving, THAT came out Beautifully!! You want to talk a little bit about your process? How did you get from the photo to the finished board? Your process with the software, bits used, speeds, finishing technique? Everyone likes to brag and I'm no different. I enjoy seeing other's work but the main reason I come here is to learn and expand my skills. I enjoy seeing what people did but I also enjoy learning how they did it. Very nice job on the tree. Bit of paint bleed with the red oak but that should be expected. It usually takes me 3-4 coats of a sealer before I paint and sand on oak. Yeah, little paint bleed. It will take me a bit to get it all figured out. With Vcarve pro I used the trace bitmap to get all my vectors. Then used the engraving toolpath. My weapon of choice was a v-bit 90deg .5" diameter and a 1/4' shank. I had the max cutting depth at .15", step over at .02", Spindle speed at 16,000, feed rate of 40"/min and plunge rate at 20"/min. I probably should have cranked up the speed but since this was only my third overall use of the machine, I was yes.. a little scared. lol My first cut using my CNC machine was to cut a circle using a CAD program that my brother has for his 3D printer. My second time using my CNC was on a test cut with one of the free trial software projects. I choose the Grocery list file. It turned out ok on some MDF. Then I downloaded the full version and I attempted the tree for my sister. I have lots to learn! Yes, it is possible using VCP. Here is only one of many I've done. Step back a little, and the image really shows up. That's awesome! So do you use the drilling toolpath to do that? The method I use to prevent bleeding in red oak is to spray on three coats of clear polyurethane and allow to fully dry. Then apply a dark gel stain over the carved area and work it in with a 1" or smaller chip brush. Then lightly wipe off the surface with a folded flat paper towel that has been lightly dampened with a very small amount of paint thinner on the paper towel. It usually takes a few light wipes with more clean dampened paper towel to clean off the surface leaving only the gel stain in the recesses. The gel stain does not need to be a thick coat. You just want to color the painted crevices. This method stops the capillary action because the polyurethane and gel stain can't enter the pores of the wood and cause the streaking. If you wish to, you can stain the whole piece of wood with a liquid stain first, let it dry, apply the three polyurethane coats, then then follow the procedure above. All of my Paradise box, guitar, and other projects use this method to get the sharply defined edges to the carvings. For 3D models, do it this same way, but selectively wipe off the 3D models to get a gradient darkening of the gel stain at the base of the model's edges. It's a lot easier and faster than it sounds. It could be beneficial for these photo carvings, but I haven't made one of these so far. Also, my go-to bit would be the Whiteside #1540 60 degree 1/4" shank solid carbide cutter that has a near zero tip width. 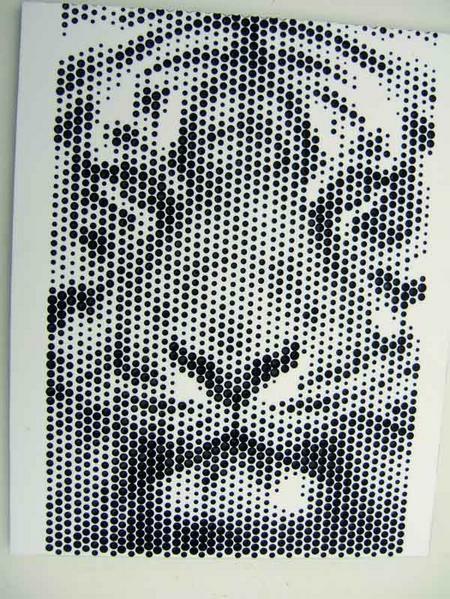 It will give you cleaner holes with a little more depth for a given dot size. Well I will tell you for your try on the vcarve you did a fantastic job!!! Be careful now you will end up being hooked. your imagination has no limits. lsvien wrote: It usually takes me 3-4 coats of a sealer before I paint and sand on oak. If you don't already do so you might use a pore filler (not the same as a lacquer-based sanding sealer) on oak and other open grained woods. DakotaBusy wrote: That's awesome! So do you use the drilling toolpath to do that? 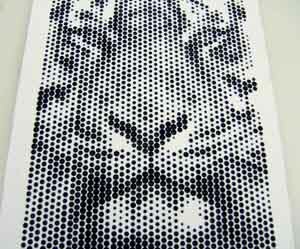 download and install the halftone gadget.